There are no reviews for Archetype yet. You can write one. Featured on MTV2 Headbangers Ball, Vol. 2. "Archetype" is directed at guitarist Dino Cazares, (after the band reformed): "The infection has been removed / The soul of this machine has improved". 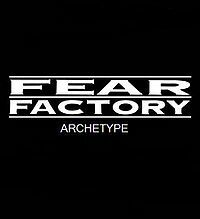 Frontman Burton C. Bell has said in an interview that "'Archetype,' defines what Fear Factory is, completely. It has classic Fear Factory parts, and the heavy / melodic vocals, but without being forced or contrived."